Today we are travelling to assam. I m sure all the BM-ers doing this marathon, would definitely agree, that the NE states gave us a tough run while searching for their food habits. But, this gave me the strongest urge to learn more about their food habits, a deep digging gave me lead to few journals published about their Food,culture and ethnicity of their tribal life. Here i present a glimpse of what i absorbed. People are habituated to live and survive with the forest and Jhum cultivation culture, which ensure a range of ethnic foods rich in nutrition and compatible to culture and ethnicity of tribes. Since time immemorial, tribal women have conserved many local crops, ethnic vegetables and indigenous fruits used in local diet for food and nutritional security. 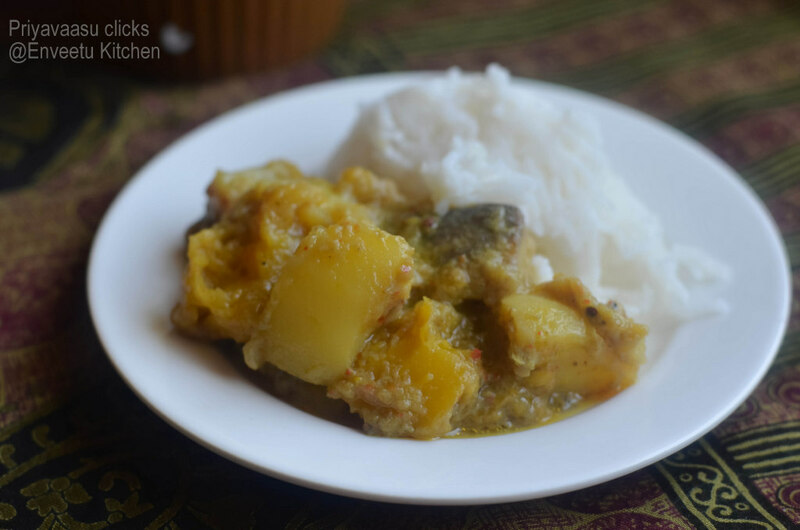 Assamese Cuisine,is a style of cooking that is a confluence of cooking habits of the hills that favor fermentation and drying as forms of food preservation, and those from the plains that provide fresh vegetables and abundance of fish from its many rivers and ponds; both of which are centered on the main ingredient—rice. The cuisine is characterized by very little use of spices, little cooking over fire and strong flavors due mainly to the use of endemic exotic fruits and vegetables that are either fresh, dried or fermented. Fish is widely used, and birds like duck, squab etc. are very popular, which are often paired with a main vegetable or ingredient. Preparations are rarely elaborate—the practice of Bhuna, the gentle frying of spices before the addition of the main ingredients so common in Indian cooking, is absent in the cuisine of Assam. Grind the ingredients given under "To Grind" to a paste. Heat the oil in a pan and add the ingredients for tempering. When the seeds splutter, add the onion-ginger-garlic-chilli paste. Keep stirring till the moisture evaporates and the mixture is lumpy. Add the vegetables, radish, potatoes,butternut squash, raw banana and aubergine, stirring well after each addition till everything is nicely coated with the spices.Add the sugar and season with salt. Reduce the heat to low, cover and cook till the vegetables are done 3/4ths of the way, stirring every now and then.Add the turmeric and cumin powders, stir well for about a minute and add the water. Bring to a boil over high heat. Reduce the heat to low, cover and cook till done, stirring every now and then. The aubergine should have lost its shape, the squash and potatoes very soft ( no sharp edges) and the radish slightly firm. Add the garam masala powder. 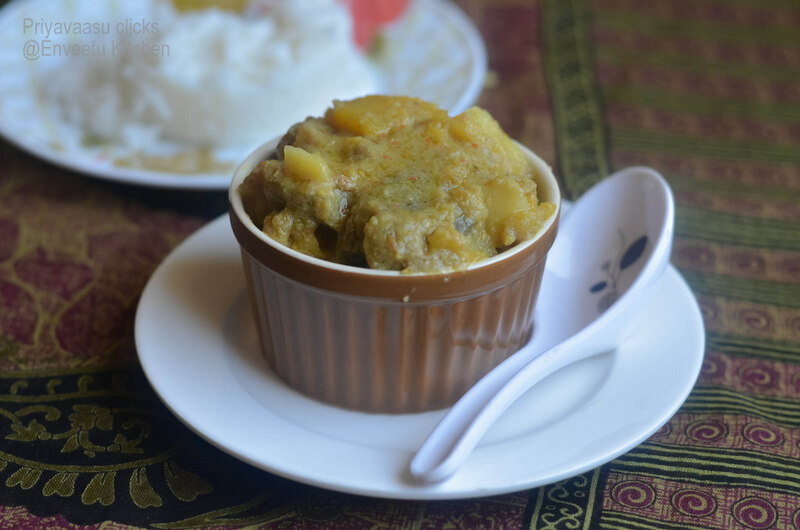 Increase the heat and stirring continuously, reduce the gravy, but do not let it dry out completely.Serve hot as a side dish with plain rice and dal. The Labra was amazing, the aroma of it while cooking, was fantastic, keeping in mind the amount of masala/spices used, it was mind-blowing. It paired well with rice, while hubby had it with roti's and i had it as such to serve my daily dose of veggies. This sounds like a nice sidedish for rice. Lovely! 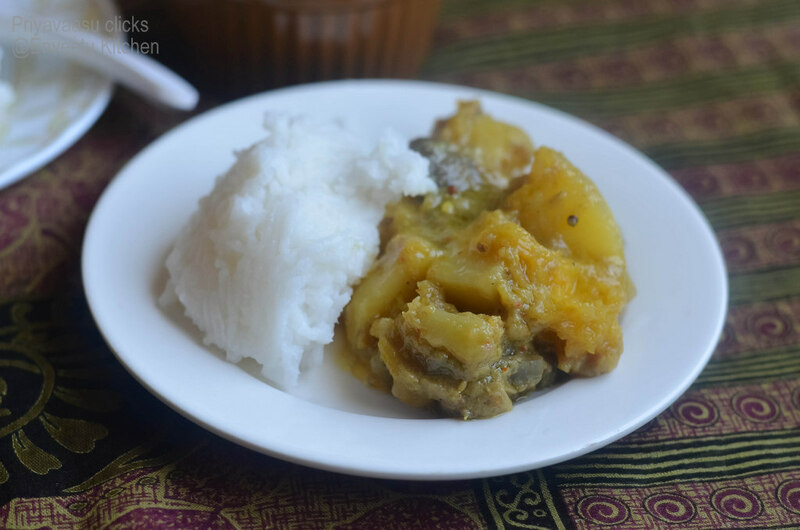 Delicious labra, panchporan makes this dish more flavourful na..Inviting dish. Flavorful curry with the paanch poran spices,sounds very inviting..
Is it the 'Labra' day today?? Good choice, Priya. I made Labra too and LOVED it. Yours looks awesome.. Lovely clicks. Nice write up. Lovely presentation and delicious dish. Love the labra! They look very very tempting. I made this too..tasted differently but delicious!! your labra looks great..
wonderful write up and a fantastic dish..I think it is a wonderful meal. Wow.. Great combo for rice & roti.. Wonderful dish!Like you I too would love to eat it as such. Labra looks like a nice side dish. So many labra recipes. Now this is on my to try list. It was a labra day for Assam. Love the flavorful vegetable medley.